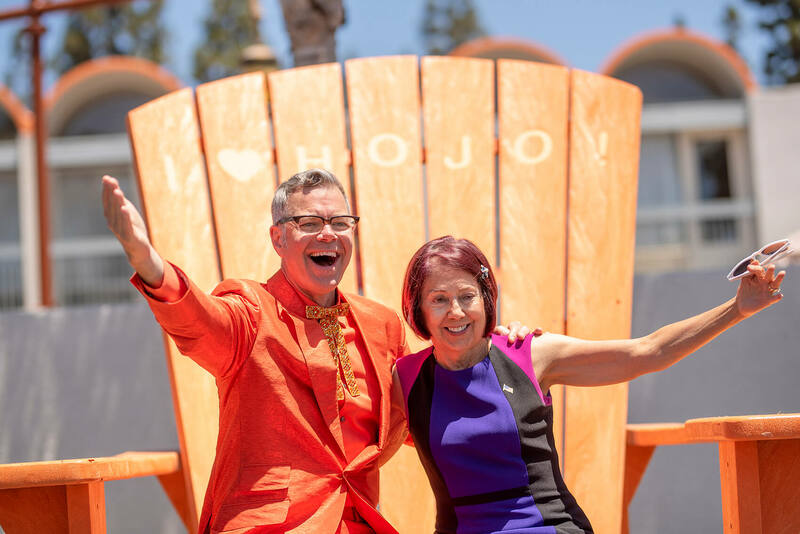 Hello and welcome to the new HoJo Anaheim website and blog! 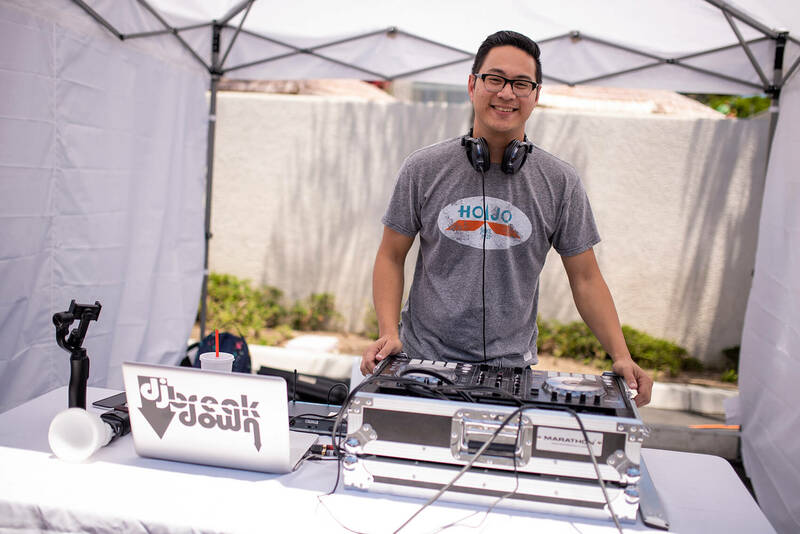 My name is Andy Castro — if my name sounds familiar then you may know me from my now-retired but long-running Dateline Disneyland blog on MiceChat. 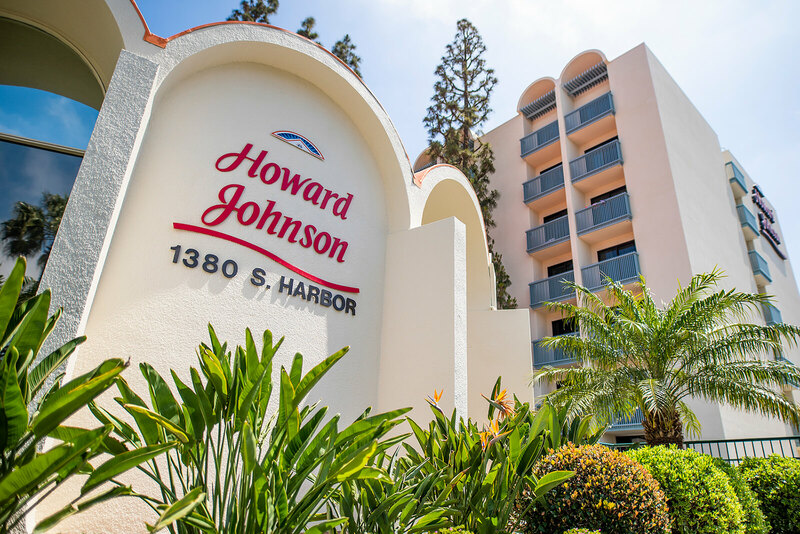 Over the course of Dateline Disneyland, I partnered frequently with the HoJo team to bring my readers a special look at the iconic Harbor Boulevard hotel. It’s been a couple of years since Dateline Disneyland wrapped up and now the great folks at the HoJo Anaheim have asked me to come back as HoJo Anaheim’s official blogger to bring you the latest news and best travel tips from their beautiful Disneyland-area hotel! 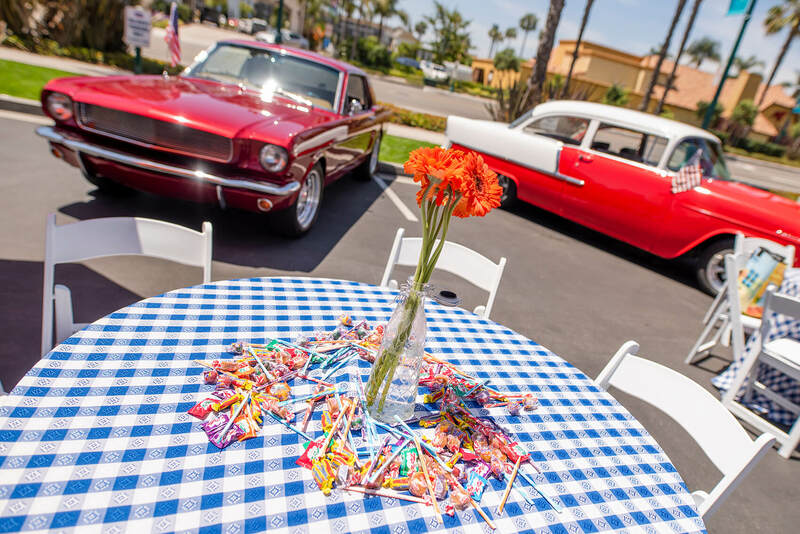 The timing couldn’t be better as our first blog celebrates the start of an exciting new chapter of retro fun at the HoJo Anaheim. Longtime HoJo devotees may have noticed our official website has recently had a total overhaul. 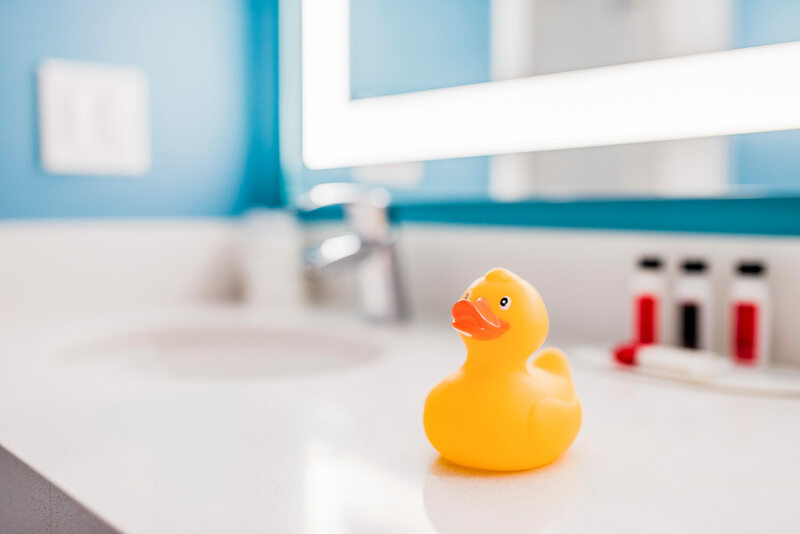 Our brand new website is a key piece in a major re-imagining of the hotel which the HoJo team has been working hard to perfect before bringing it to all of you, our guests. 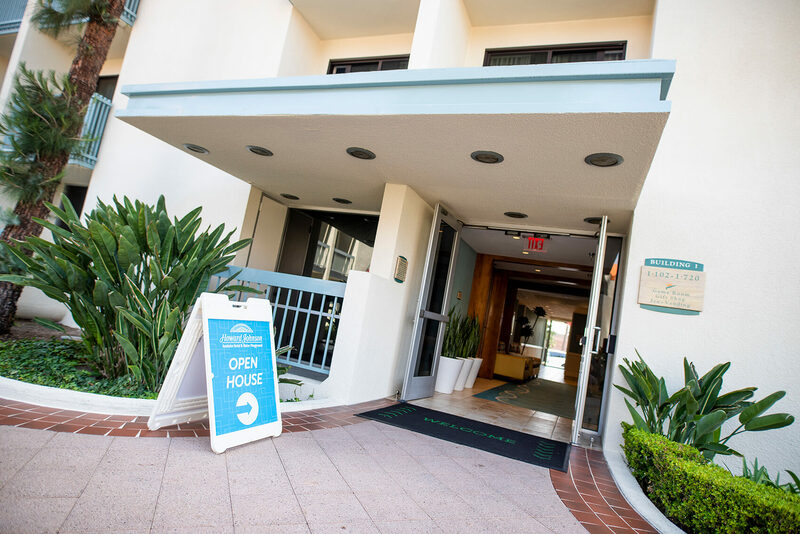 After years of planning, design, and construction, our newly-renovated Building 1 Tower rooms are here. 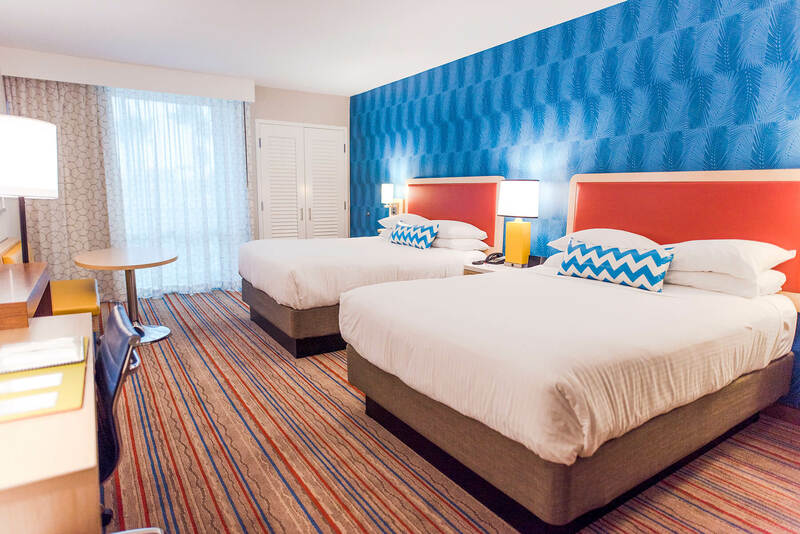 This marks the completion of an $8 million top-to-bottom renovation of 111 guest rooms in our Building 1 Tower. 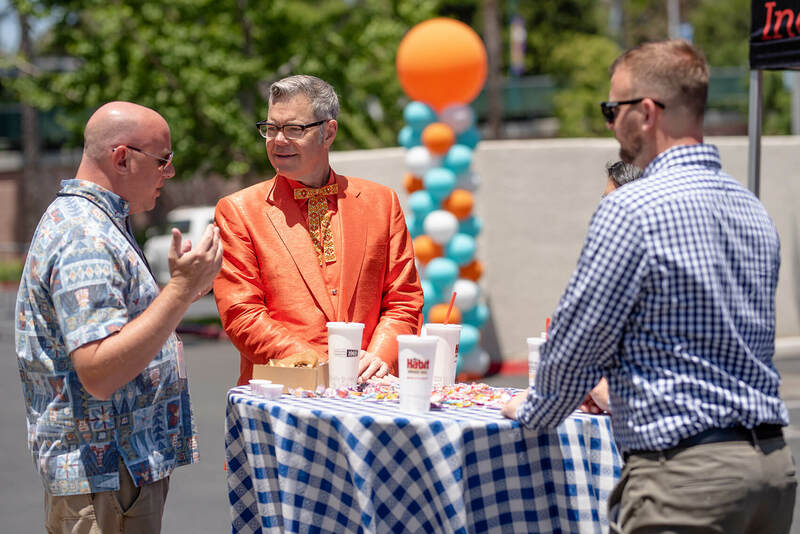 To mark the occasion, we officially unveiled our refreshed property with a fantastic grand re-opening event which included the help of the Ambassador of Americana himself, Charles Phoenix. 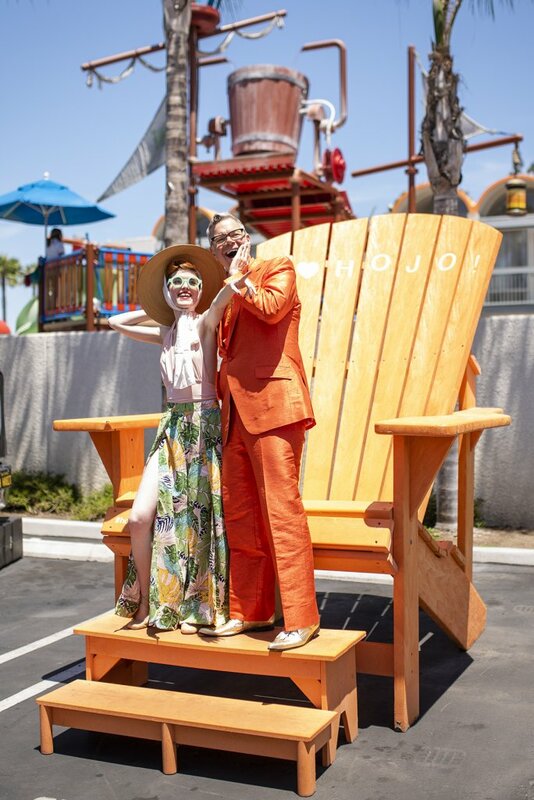 This major investment brings our classic main tower beautifully up-to-date with rooms featuring contemporary amenities including upgraded WiFi access points in every room and new Enseo TV entertainment systems with Netflix and Pandora. In addition to technology upgrades, we also worked hard to add features that our amazing guests have been requesting: bigger refrigerators, more electrical outlets (so everybody in the family can charge their devices), an in-room family dining area, and tons of new surface areas for guests to spread out and unpack when they arrive. 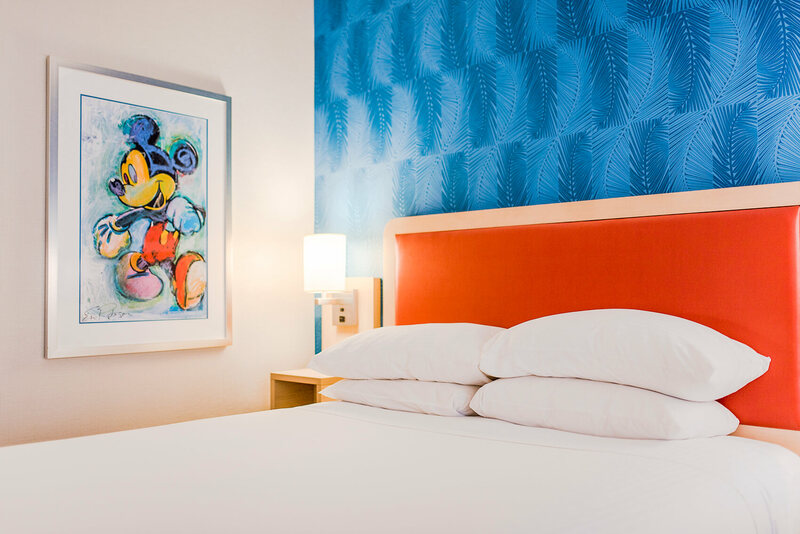 Meanwhile, the stunning new room decor bursts with a bright and delightfully retro style; featuring vintage-inspired Disney-themed art, a soothing resort blue accent wall, and a playful souvenir rubber ducky in every one of our guest room’s newly-remodeled bathrooms. Why the retro flare? 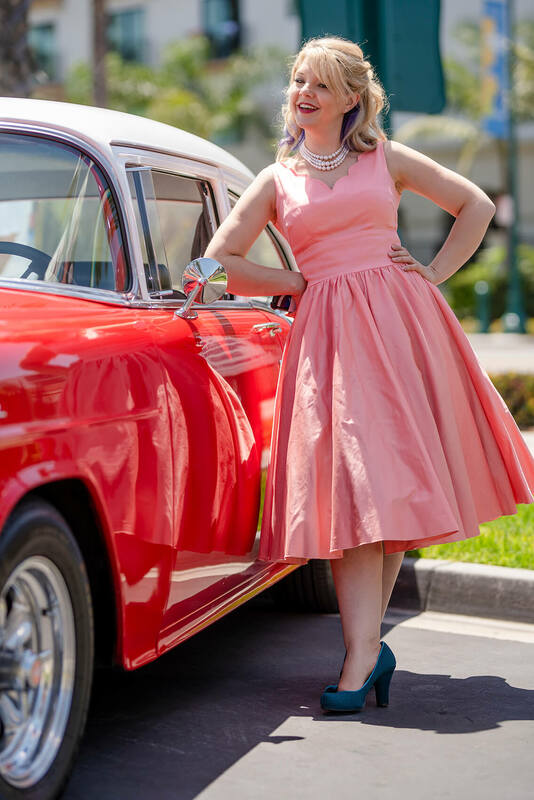 While the HoJo may be best known for our amazing views of Disneyland’s fireworks and our pirate-themed Castaway Cove water playground, it’s our hotel’s mid-century style that truly helps set us apart from our neighbors. 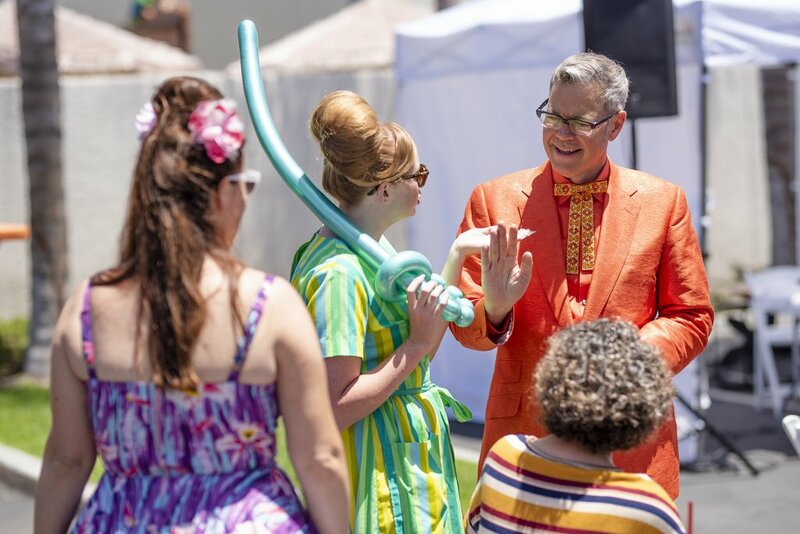 Our hotel, which opened just a day before Disneyland’s 10thanniversary on July 16, 1965, is imbued with the same wonderful mid-century magic that runs throughout Disneyland. 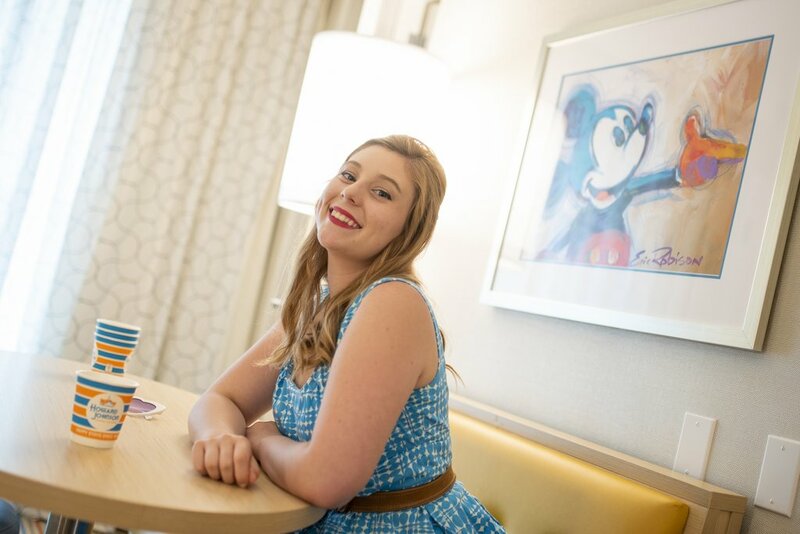 In fact, our hotel was designed by famous architect and friend of Walt Disney, William Pereira. 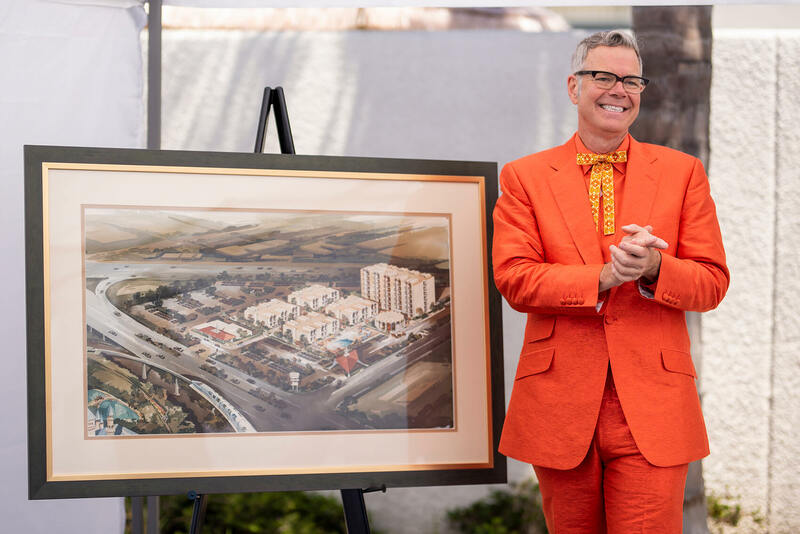 Pereira also designed the classic Disneyland Hotel located just on the other side of Disneyland from the HoJo; along with countless other iconic mid-century buildings including the LAX Theme Building, San Francisco’s Transamerica Pyramid, UC San Diego’s Geisel Library, and Communicore at Walt Disney World’s Epcot. 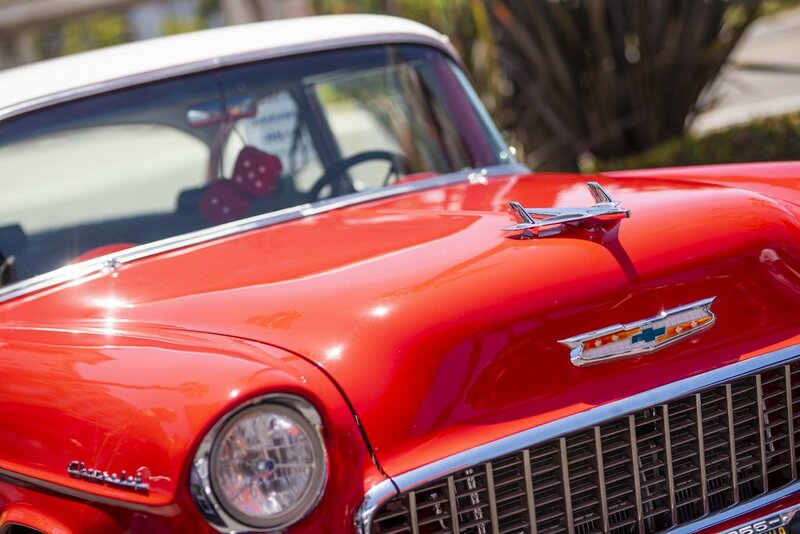 Our seven-acre HoJo was the first on the west coast (a big deal at the time!) and opened with our Building 1 room tower and four two-story “casita” room pavilions, all of which featured our trademark barrel-arch roofline, designed by Pereiria. 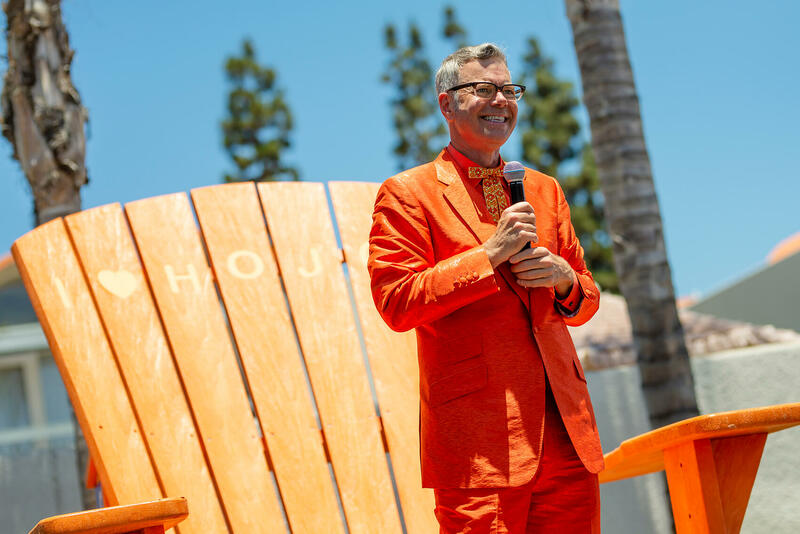 With the area’s largest pool, a charming space-age lobby building, beautiful landscaping, charming fountains, and the iconic orange-roofed Howard Johnson Restaurant, it’s not surprising that the HoJo Anaheim was bestowed with an architectural award for “Best Public Space” upon opening. 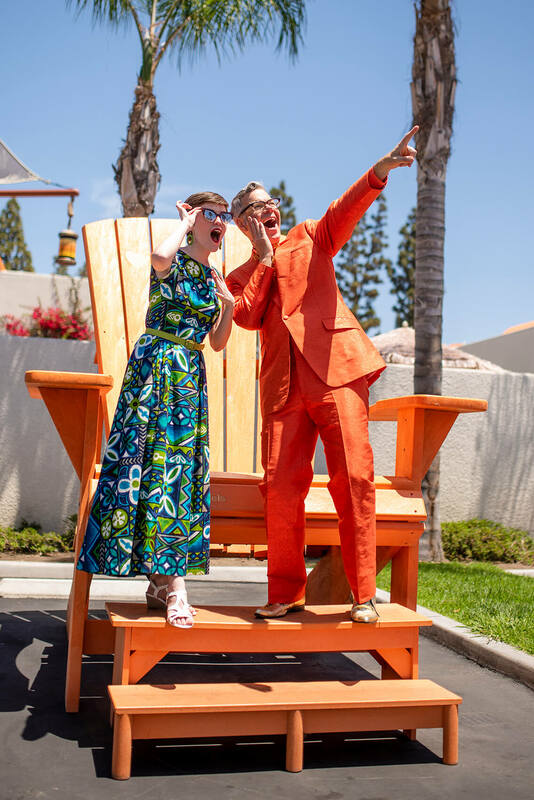 Today, at seven spacious acres and 296 guest rooms, we remain one of the largest hotels within walking distance to the park. 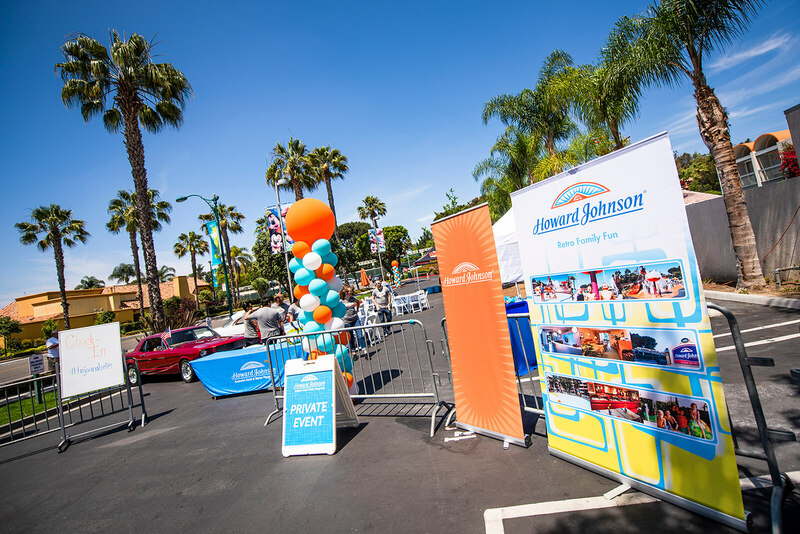 In addition to stunning views of Disneyland’s Matterhorn mountain, nighttime fireworks, and a long stretch of the Monorail track, our guests get to enjoy the luxuries that come with the extra space our property has such as a spacious resort-style layout and plenty of free parking. Our hotel has changed over the years but it’s easy to see why we’re so proud of our history. When it came time to update the HoJo for today’s guests we excitedly embraced our retro roots. 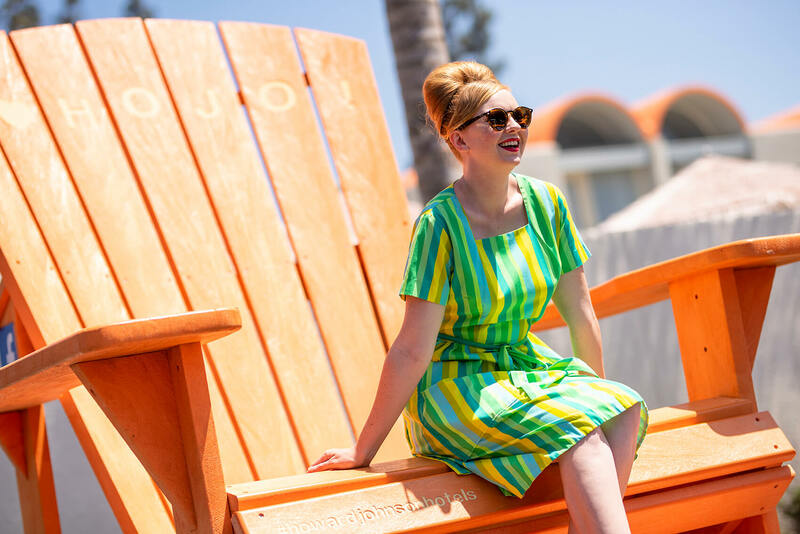 Our rooms may no longer feature the orange shag carpeting and wood paneling that characterized them in our early days but our main tower’s re-imagining definitely pays tribute to our mid-century past. 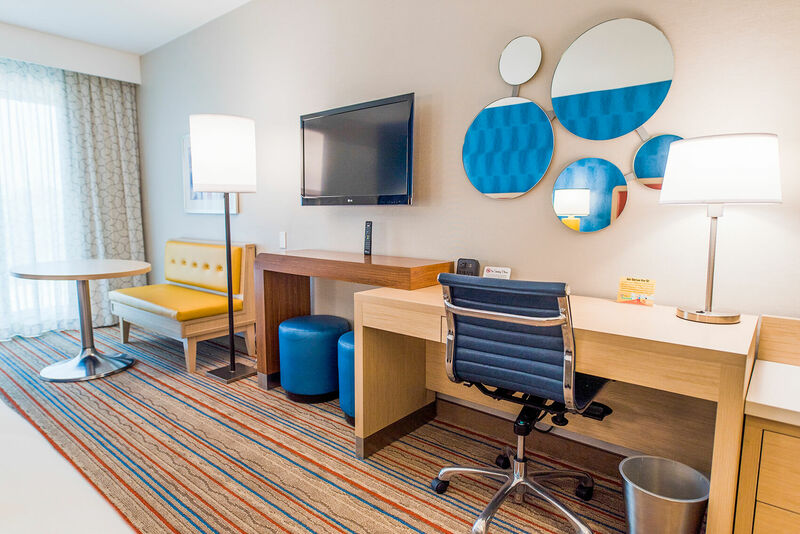 Brand new furnishings and amenities that today’s guests expect have been blended with bright modern-retro decor and special Disney-inspired accents to create a fresh and unique hotel experience that’s perfect for every Anaheim visitor. 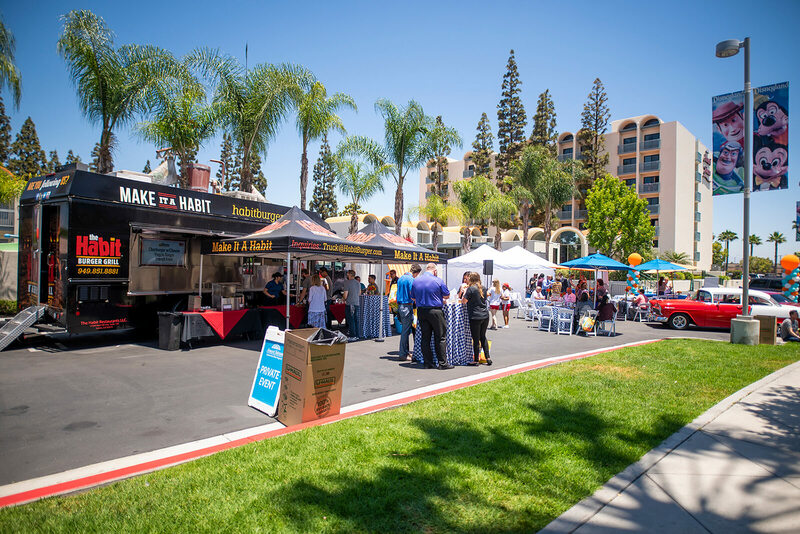 To commemorate the official debut of our new rooms, we celebrated on June 14 with a grand reopening party for local business people, our neighbor hotels, and invited guests. 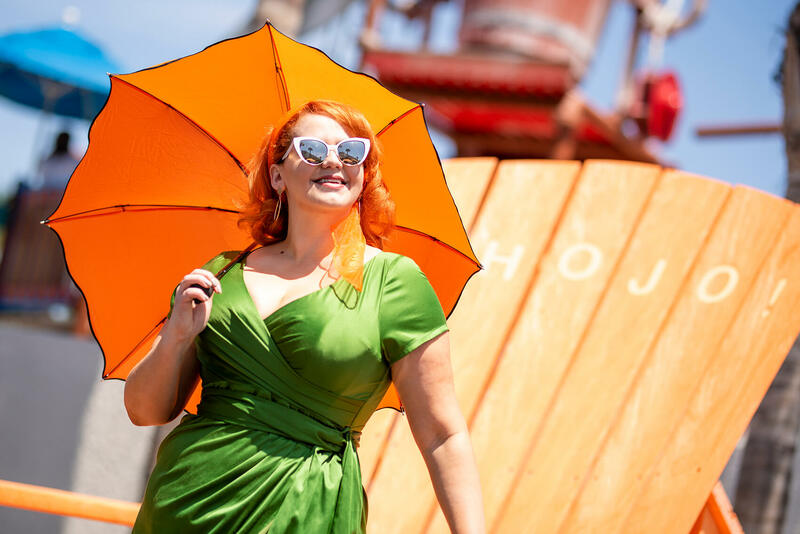 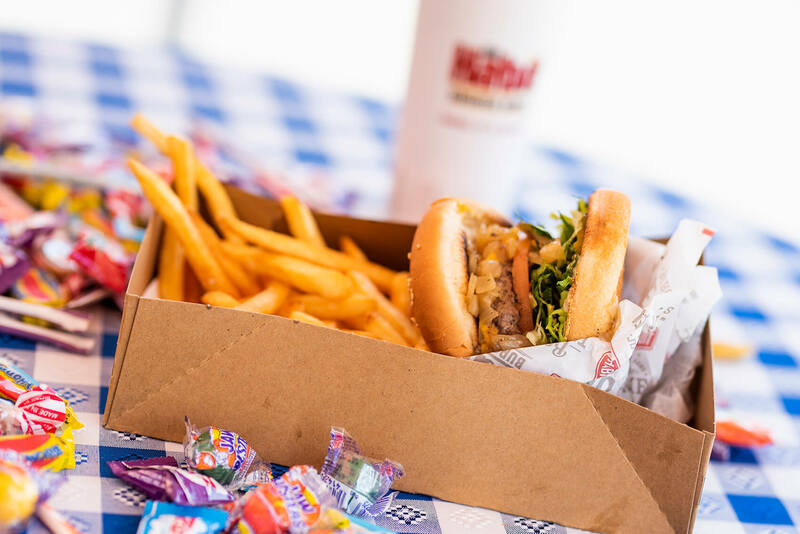 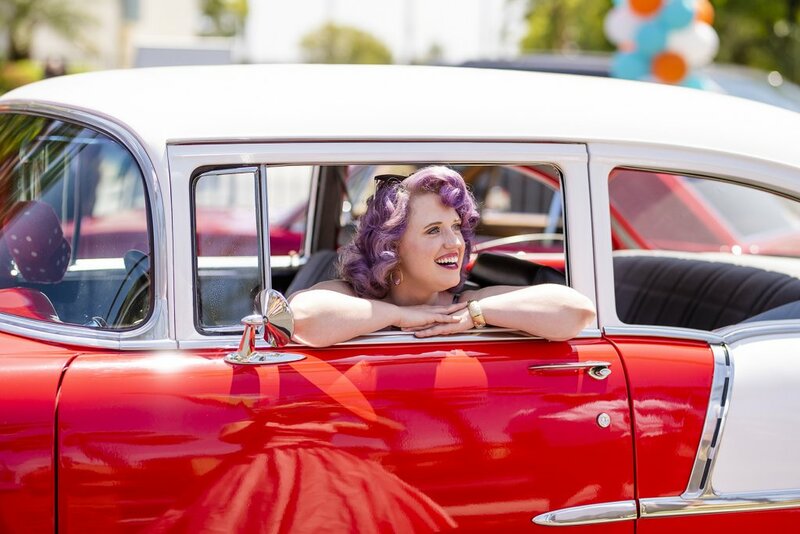 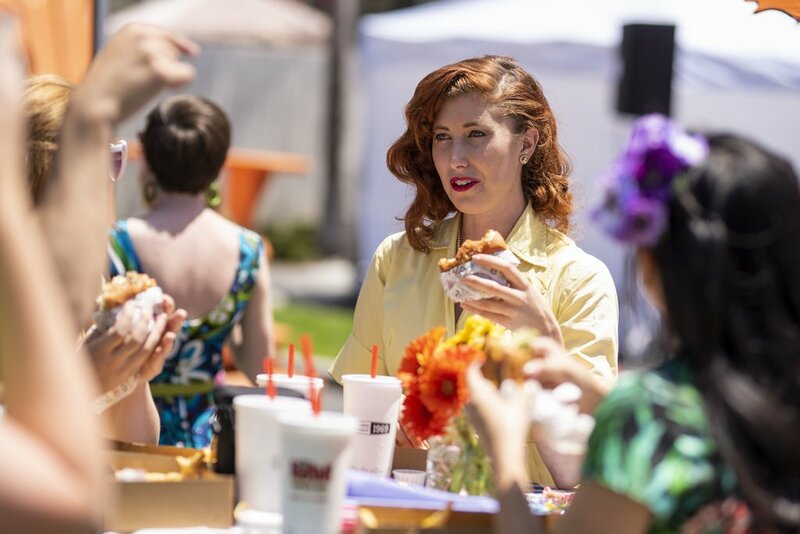 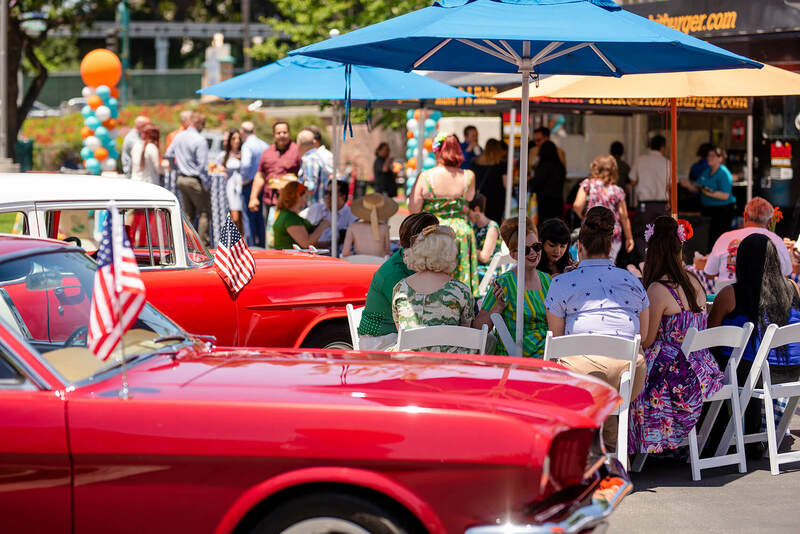 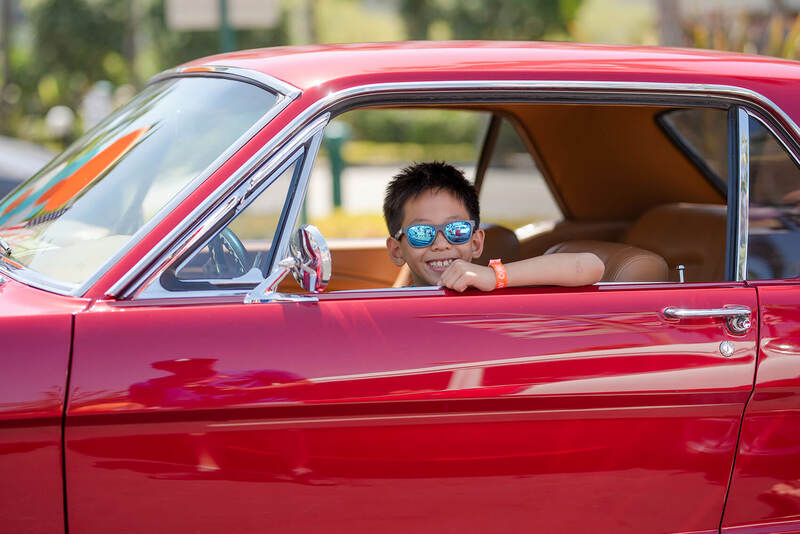 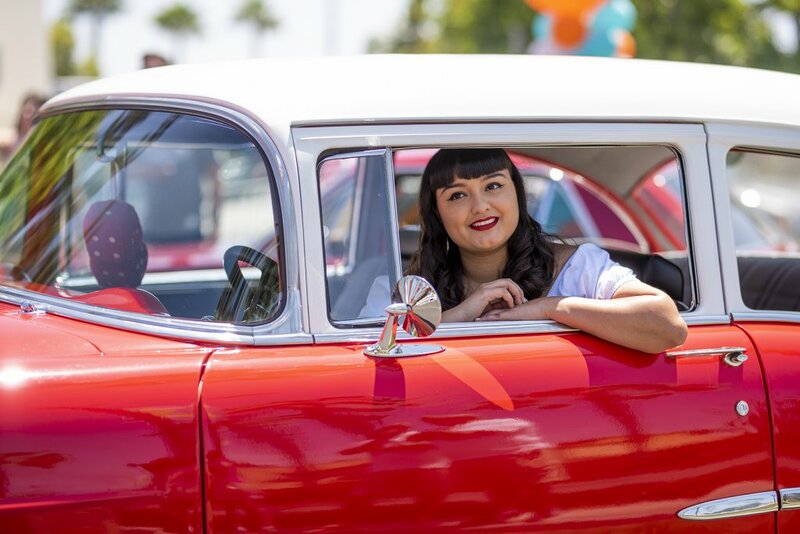 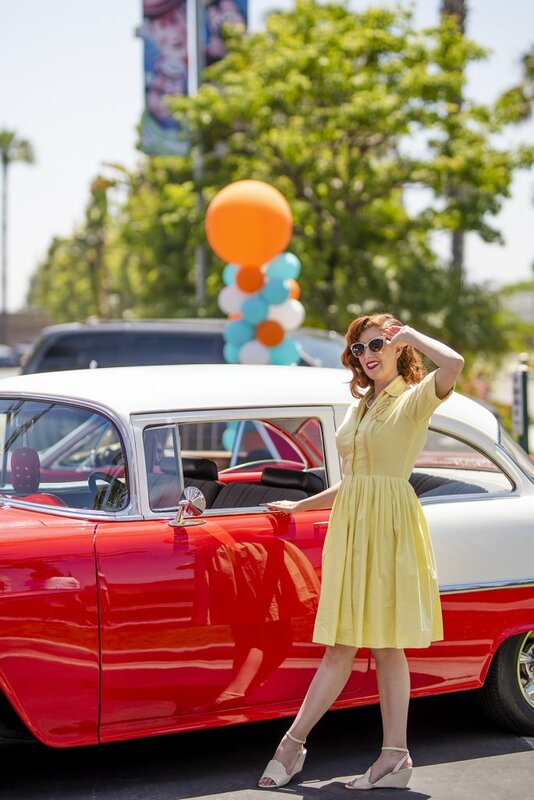 We marked the occasion with classic cars, some retro friends, and delicious all-American burgers from The Habit — all in the shadow of our newly-renovated room tower. 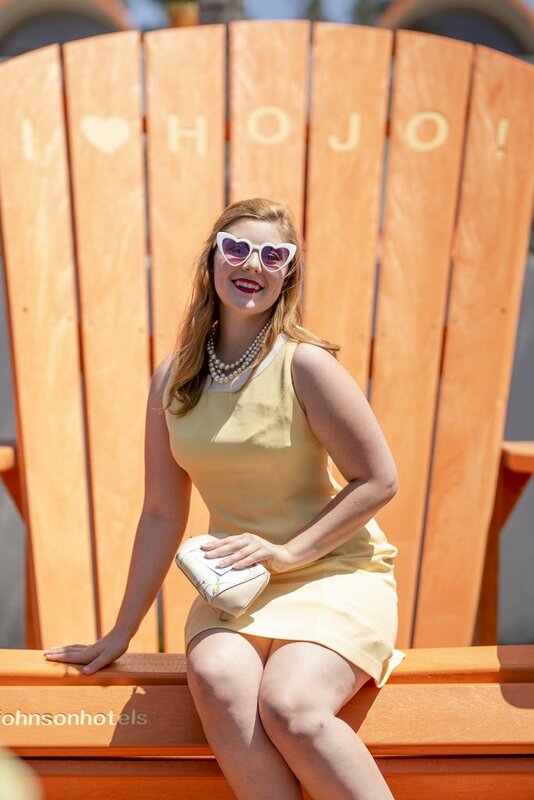 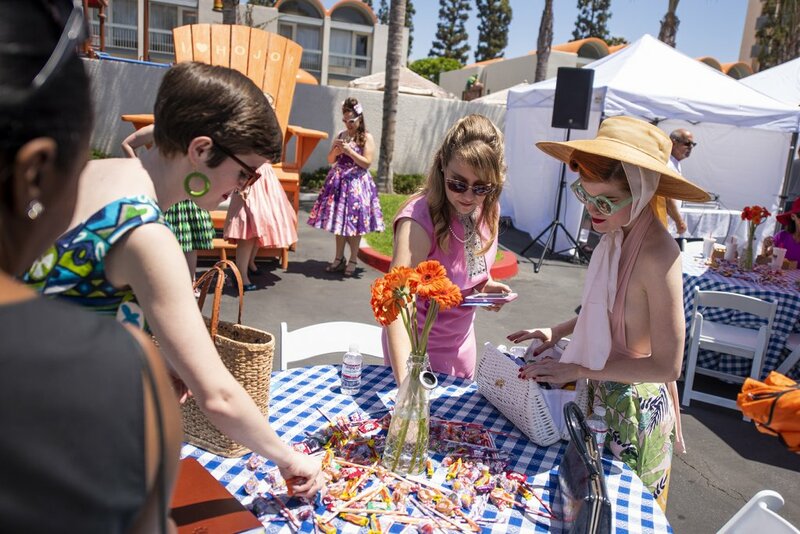 We opened up the time portal to invite some retro friends back to enjoy some sun and HoJo’s re-imagined digs. 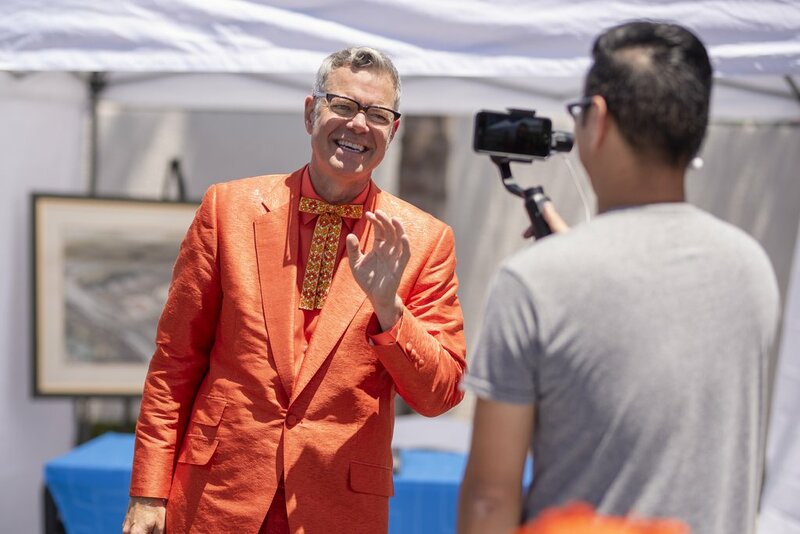 The highlight of our festivities was a visit from the Ambassador of Americana himself, renowned pop culture historian Charles Phoenix — complete in his orange HoJo-inspired suit! Charles checked-in with our fans at home via Facebook Live, giving them some insights to our unique mid-century history while showing off our original architectural rendering which was on display at the event. Check out a replay of that Facebook Live broadcast with Charles Phoenix below! 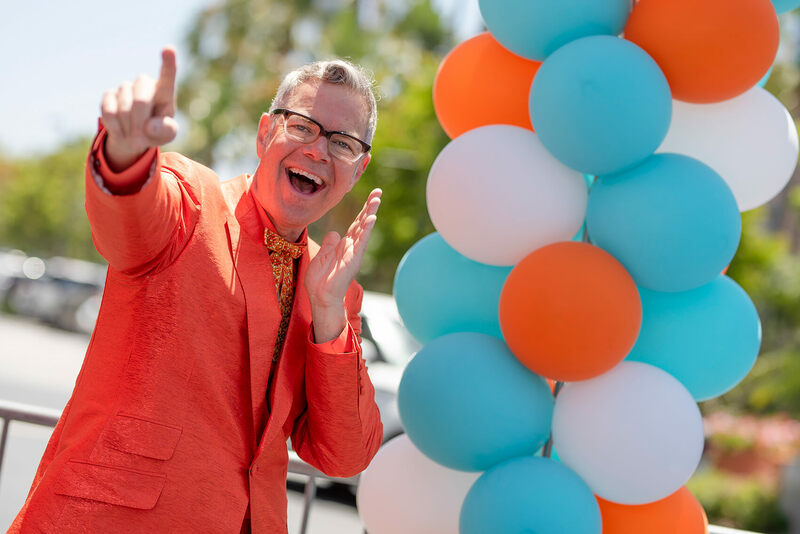 Live At the Howard Johnson Anaheim grand opening party! 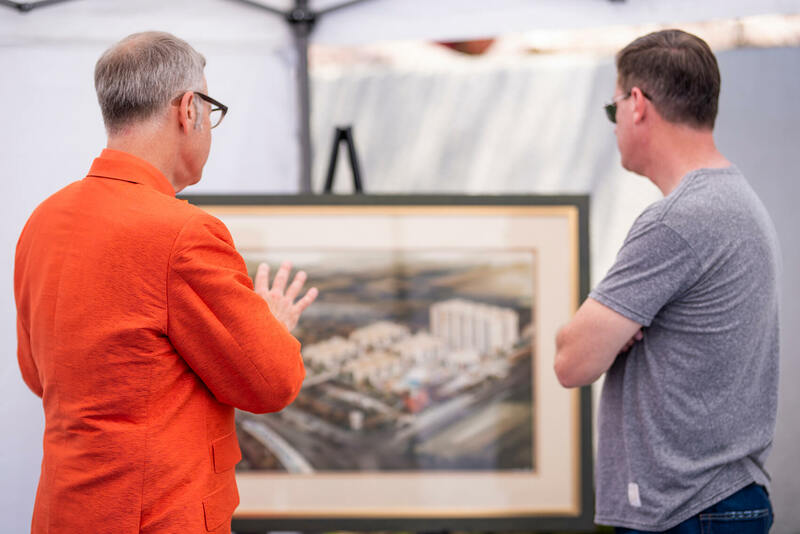 Here is Charles Phoenix and HoJo Anaheim General Manager Jonathan Whitehead examining the original architectural rendering of the hotel. 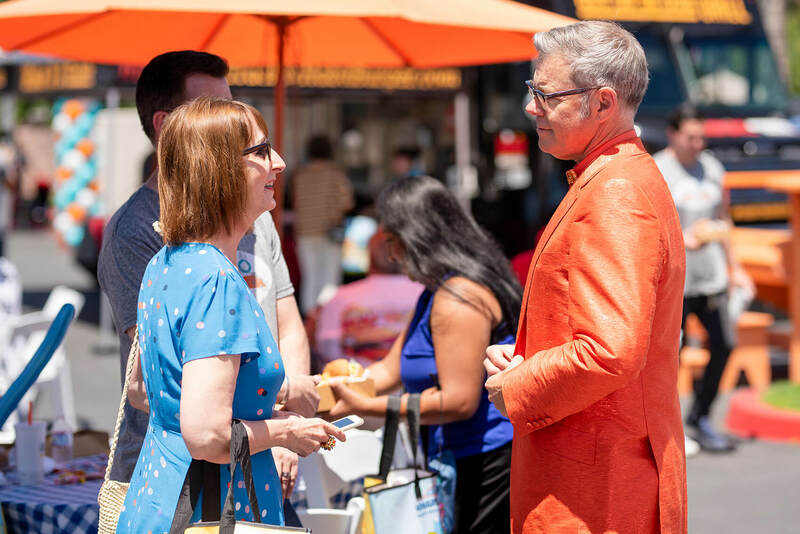 Charles made the rounds, mixing-and-mingling with all of our invited guests, bringing his immense pop culture knowledge and love of all things retro to the party. Below, Charles discusses our swanky new guest rooms with their wonderful designer. 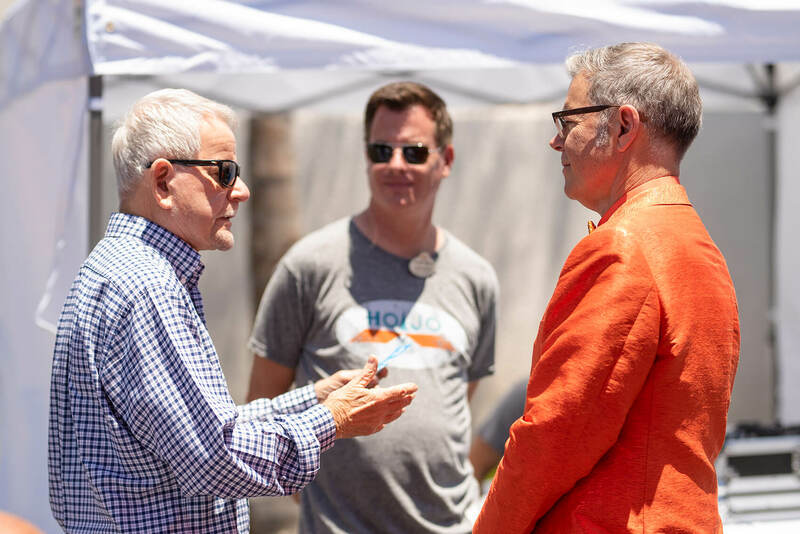 Our owner James P. Edmondson shares some history with Charles Phoenix. 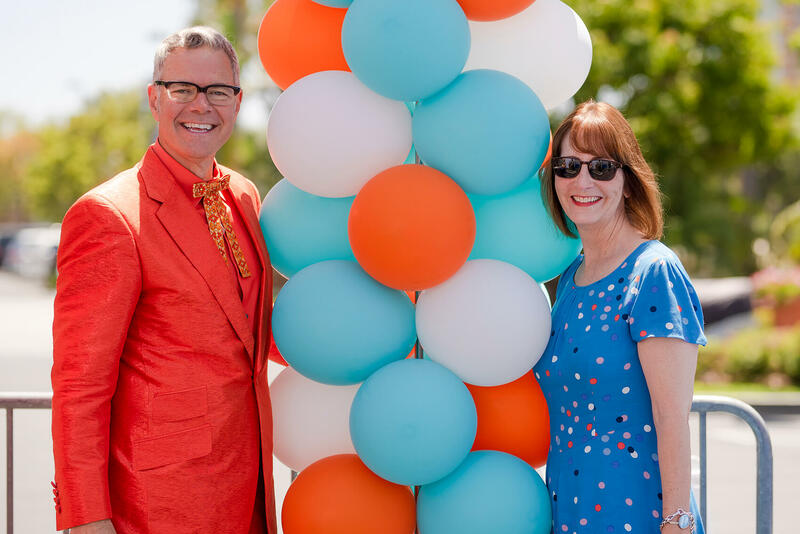 Charles Phoenix and Councilwoman Lucille Kring. 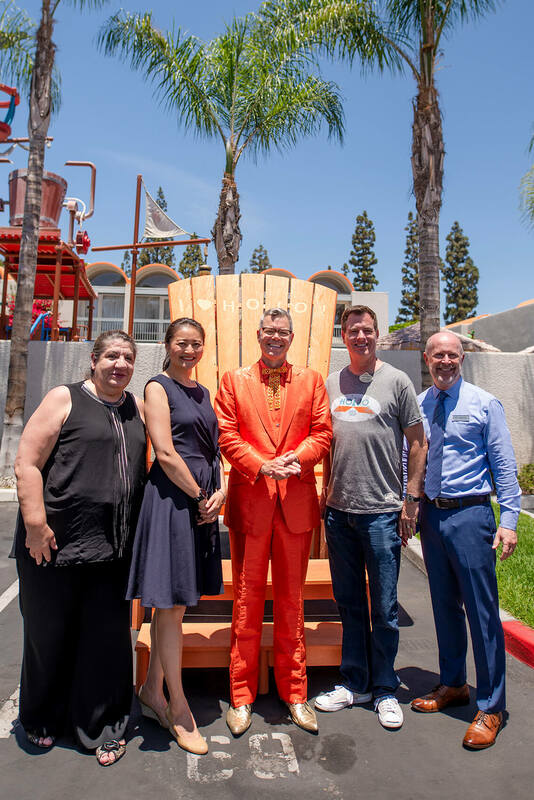 From left to right: Lina Ramirez (Director of Franchise Operations), Cynthia Liu (Howard Johnson International, Brand Vice President), Charles Phoenix, Jonathan Whitehead, Bill Cleaver. 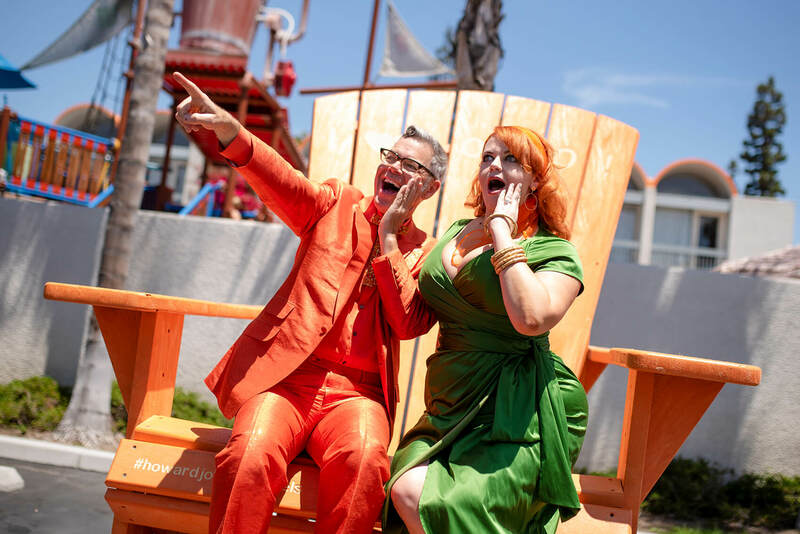 Some of our other guests including MiceChat’s Todd Regan and Disney artist Jody Daily mix-and-mingled. 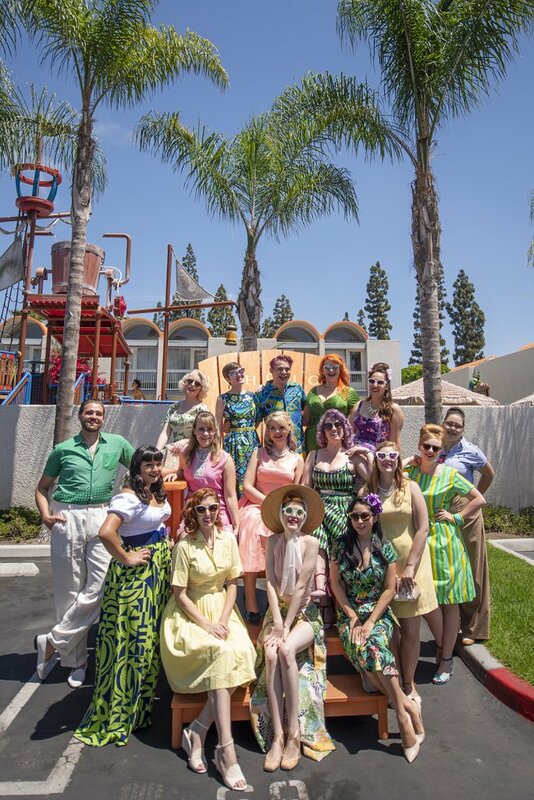 Charles posed for fun photos with HoJo Anaheim’s retro friends. 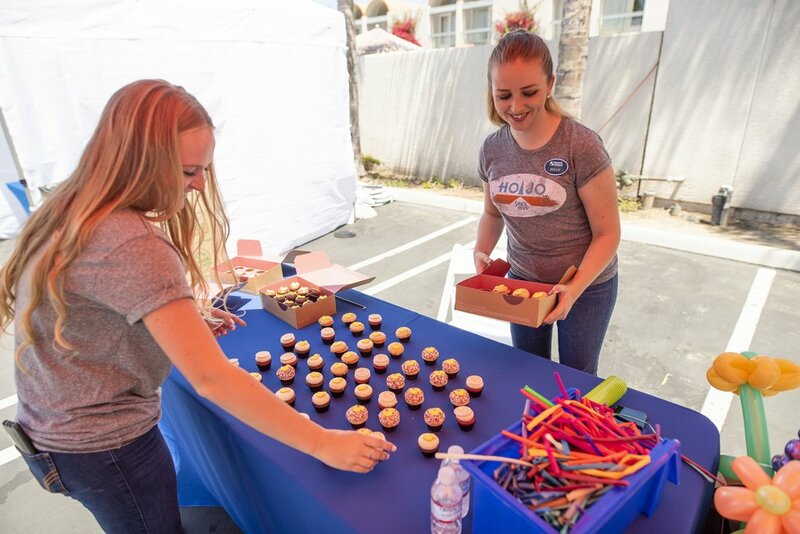 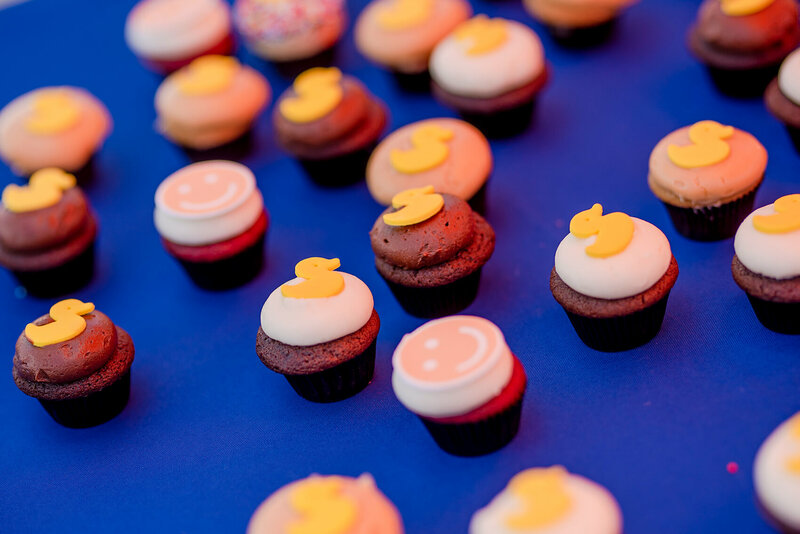 Our hotel staff got in on the celebration as well, spinning lively tunes, enjoying Habit burgers, and serving up cupcakes to guests. 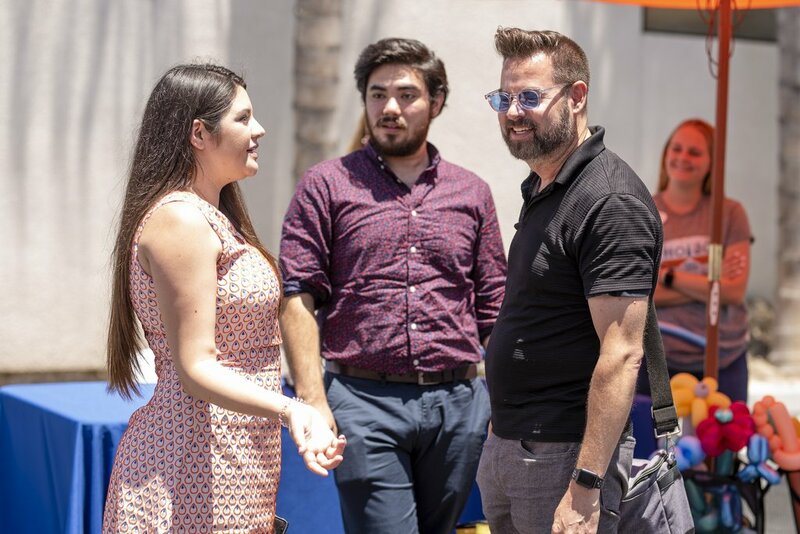 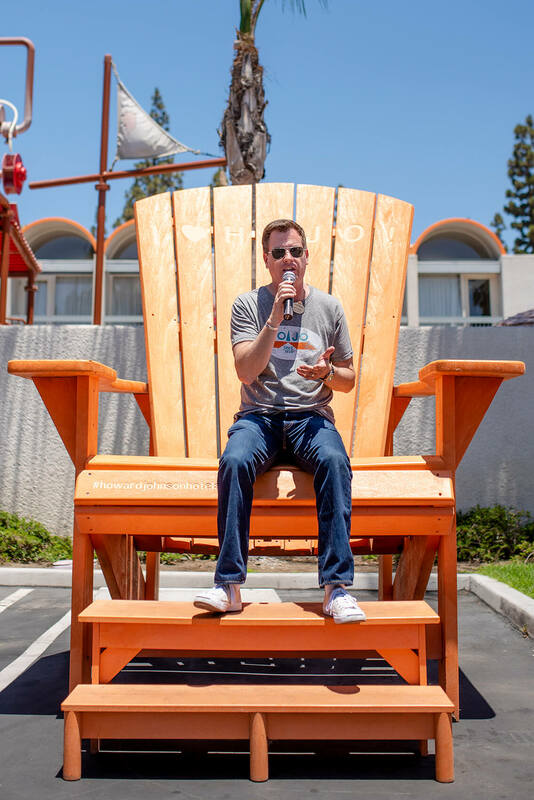 Our special retro re-opening event culminated with some words from our General Manager Jonathan Whitehead who shared his thoughts on our major remodel and HoJo Anaheim’s mission behind this massive project. 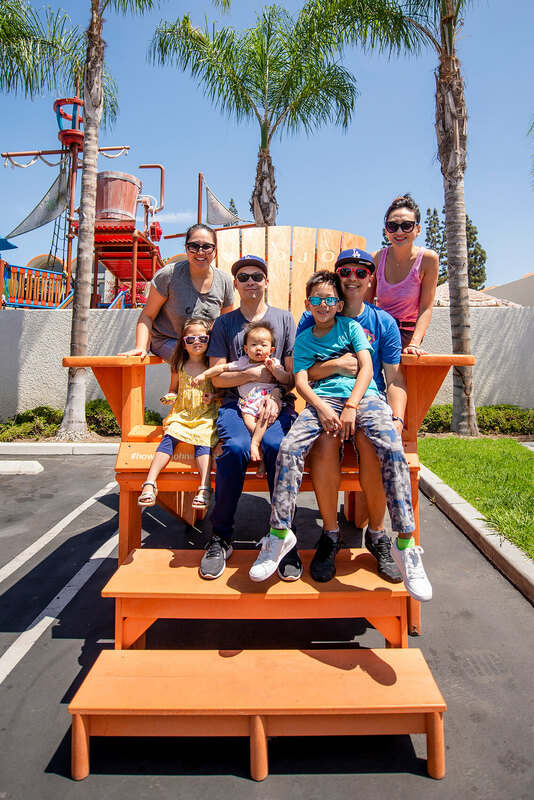 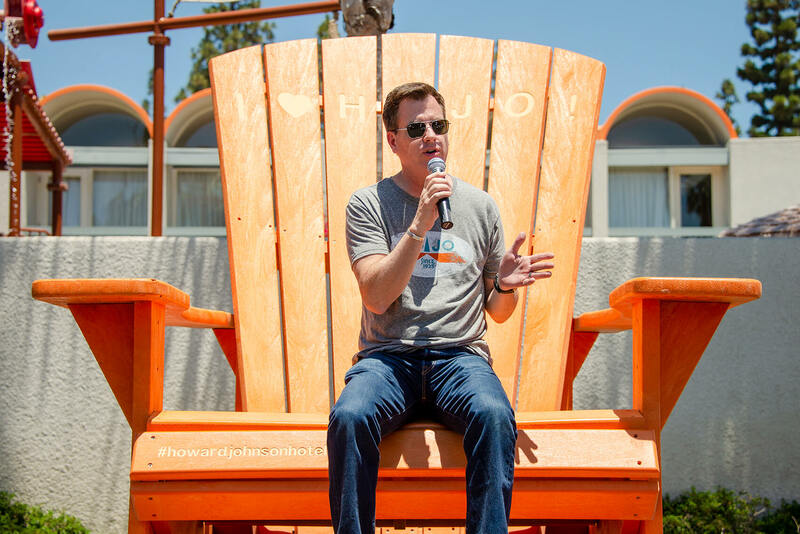 Jonathan noted that for us at HoJo Anaheim, it all comes down to creating the best possible experience for everybody in the family. That means a seamlessly fun vacation experience that our guests will remember forever. Jonathan explained that our retro redesign aims to capture that special idealized 1960s vacation atmosphere for a new generation, offering a place where families can play, stay, and reconnect in a relaxing, welcoming environment. 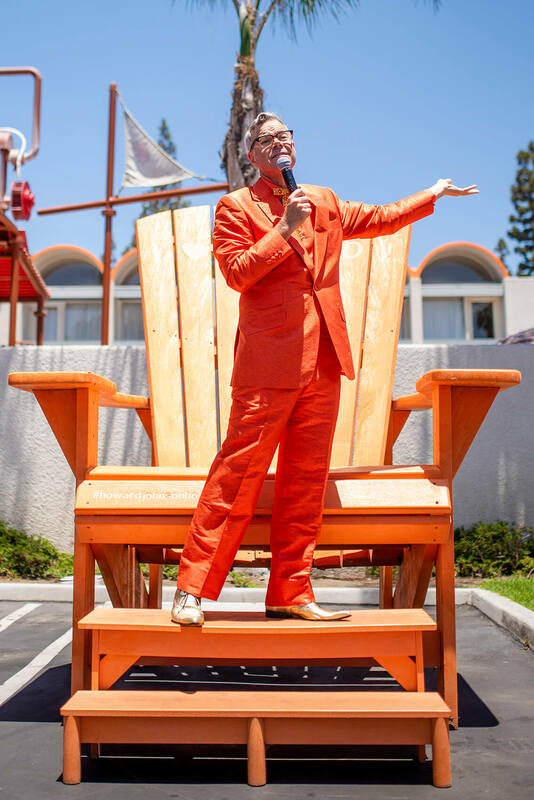 Jonathan then welcomed Charles Phoenix to our giant orange beach chair stage, where he spoke on the mid-century history of our property, its distinctive retro qualities that set it apart from the rest, and then gave his wildly enthusiastic retro stamp of approval on our newly renovated rooms. 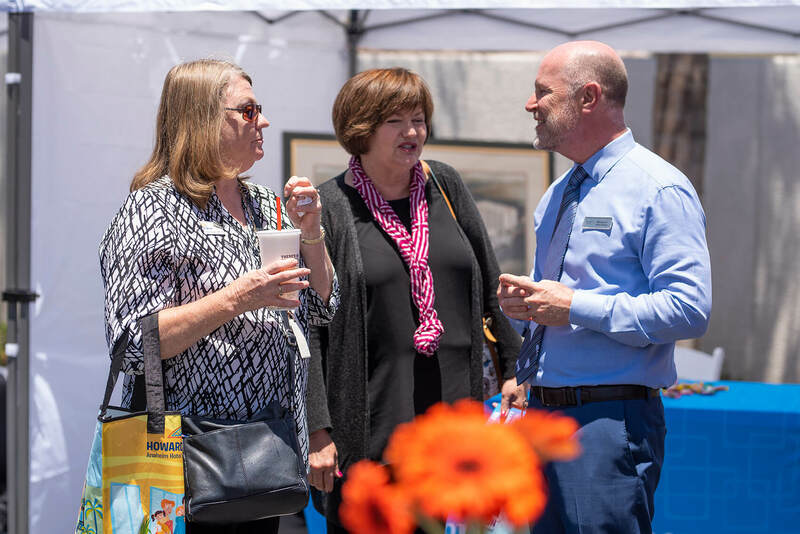 After Jonathan and Charles spoke, our party guests were invited to walk over to Tower 1 to enjoy an open house and tour our new rooms. 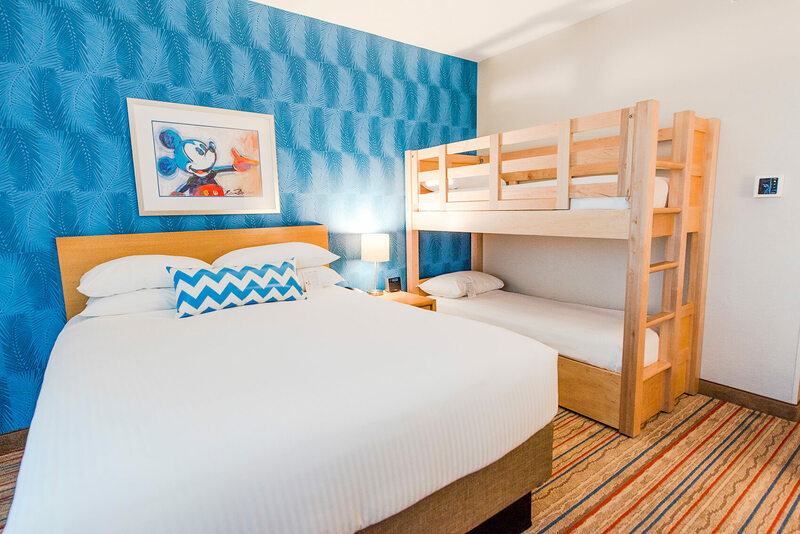 Want to see the new rooms at HoJo Anaheim? 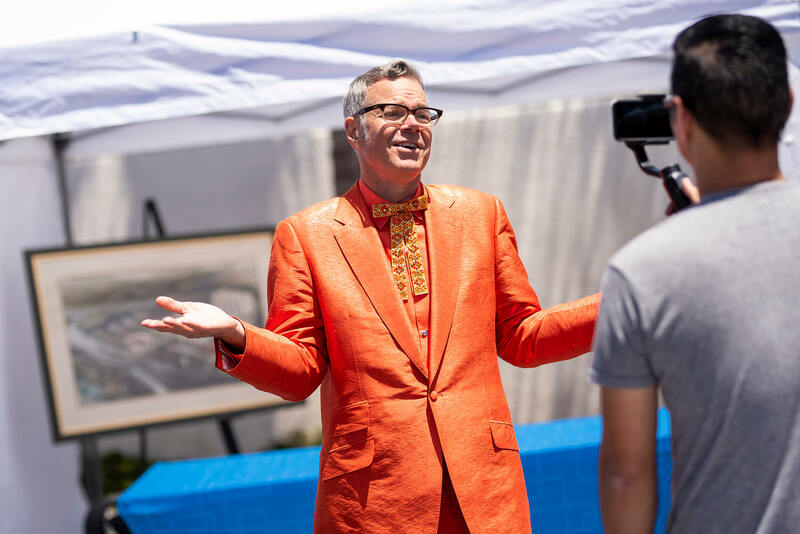 Check our Charles Phoenix’s special video tour of the hotel and guest rooms below! 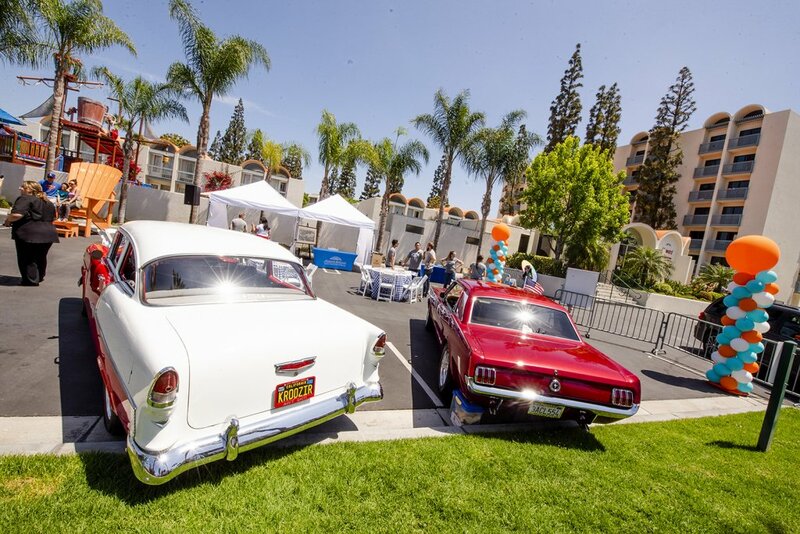 And with that, the newly renovated and reimagined HoJo Anaheim is now open and ready for guests! 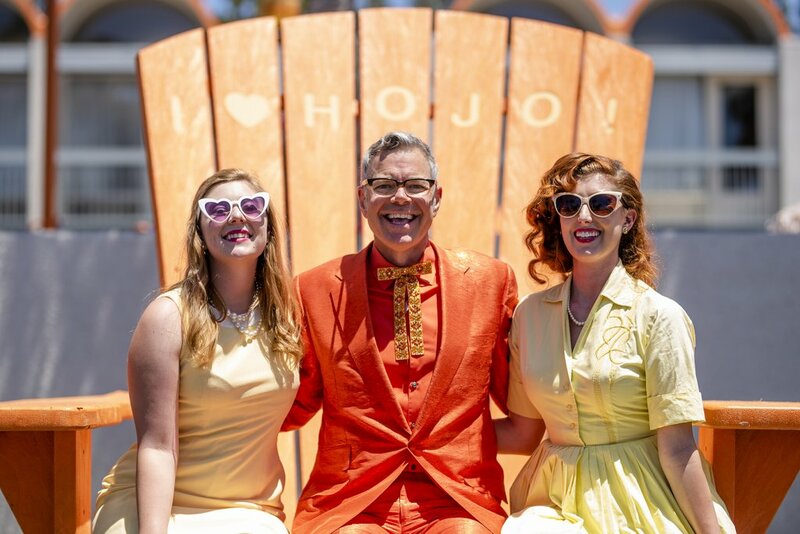 But what’s next for HoJo? 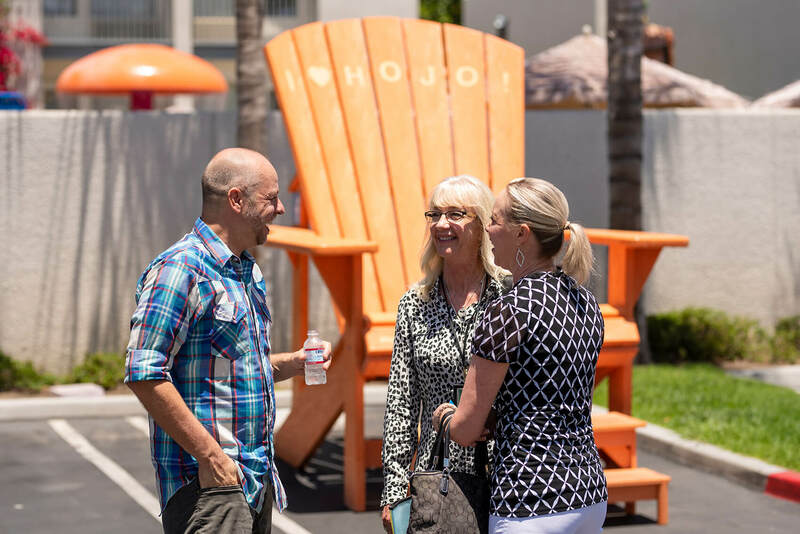 Well, we’re not slowing down and will soon begin remodeling an additional 100 guest rooms in HoJo’s Building 2. 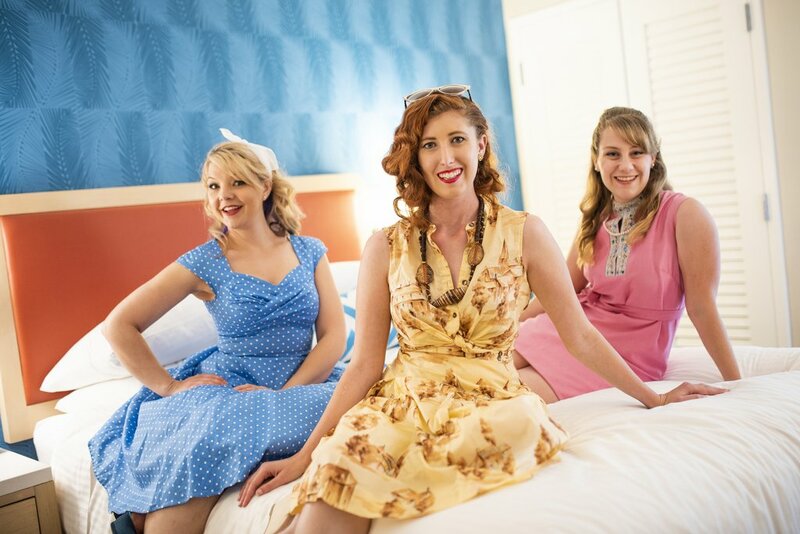 The design of those rooms will be similar to our retro Building 1 Tower rooms but with special accents that will give our Building 2 rooms a special character all their own when they open in 2019. 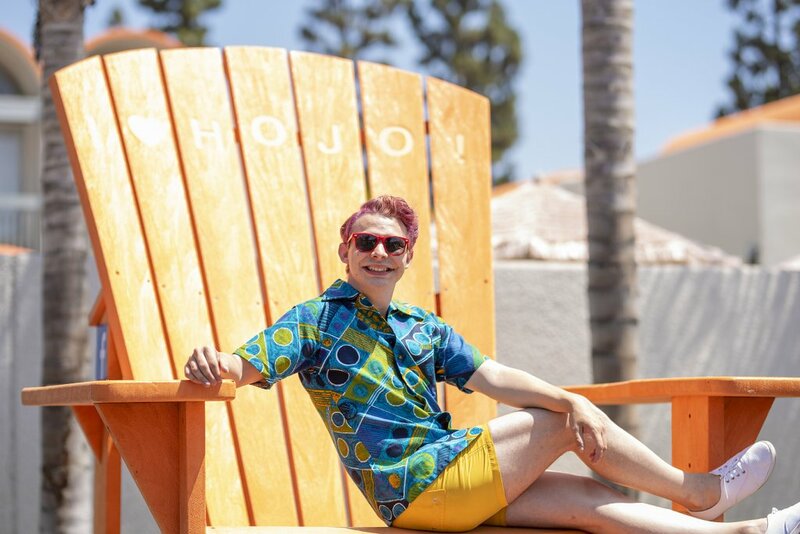 Meanwhile, we’re extremely excited to welcome you to enjoy this first phase of the all-new HoJo and hope you love our new look and new rooms as much as we do!